Adapting to the world outside its mother’s womb is challenging for every newborn baby. For the baby whose body is not fully mature at birth because they were born prematurely or did not grow properly in the womb, starting an independent life is much more difficult and there are many factors that put them at greater risk of developing infections. Fragile, immature intestines take in both nutrients and microorganisms sooner than they should, and preterm babies also have higher nutrient requirements because they have missed weeks in the womb during which babies grow rapidly and build up reserves in their bodies. populations of microorgansisms on the mother’s body and in her breast milk. Colonising microorganisms play a key role in how a newborn baby’s intestines mature and in how the intestinal immune system develops. The lower the gestational age at which a baby is born, the more fragile the complex cell structures in its body and the greater the risk of bacterial invasion and the inflammatory response that follows. Potentially harmful bacteria and viruses are everywhere and NEC only occurs after birth and the start of intestinal bacterial colonisation. Supporting babies to breathe is also a potential risk factor as it can increase the amount of oxygen in the intestines, which leads to the growth of particular bacteria. 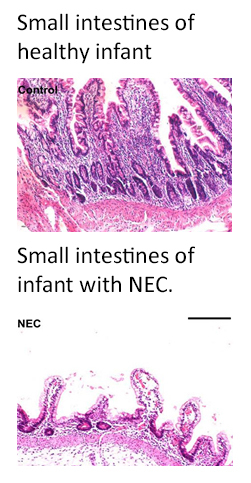 There are different groups of bacteria associated with NEC depending on whether it starts days after birth or weeks later, however gut colonisation is one of multiple factors in the development of the disease. It is believed that a combination of prematurity, bacteria, feeding and a trigger, like an infectious agent, are all involved in the development of NEC. Insufficient intestinal blood flow caused by heart or respiratory conditions may also play a part as intestines are more sensitive to changes in blood or oxygen supply and are highly susceptible to infections. The intestines have a number of defensive mechanisms in place and one of the most powerful and efficient is the barrier of mucus that is secreted to cover the cells of the intestine. It establishes a barrier between bacteria and the cells of the intestines and also helps good, protective bacteria. As they are still developing their mucosal barrier, all newborn babies, and especially those born very prematurely, do not have the same level of defences as older infants and children. Rarely, cases of NEC have occurred in clusters and these may have been due to infection. There are many reasons why preterm babies are more likely to develop infections and more research is needed to give us a complete understanding of their unique immune systems. At present, the best ways we know to prevent necrotizing enterocolitis are by careful use of antibiotics and feeding babies human milk as this helps to guide and support the appropriate development of their delicate intestines and immune system.